The Delta Children Canton Convertible Crib is a classy, beautiful and very versatile addition to your nursery room, one that will certainly thrill and delight your newborn baby through its unique sleigh-like design, pleasant color and comfortable mattress. 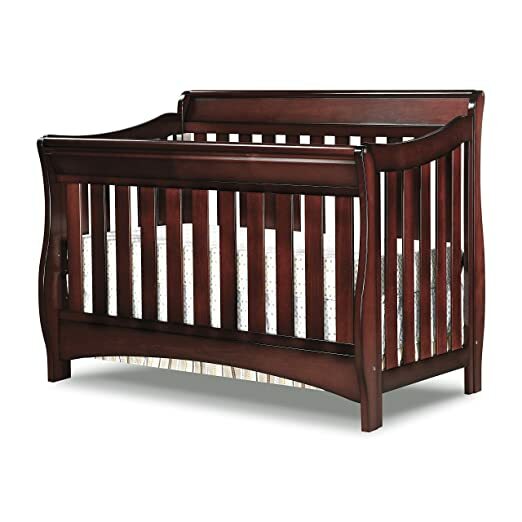 In addition to the beautiful finish that makes it stand out from the rest, the Delta Children Canton Convertible Crib also happens to be a four-in-one type of baby crib, which means that you can easily convert it into a toddler bed, into a day bed and eventually into a full size bed, with little to no hassles. Functional and very cost-effective, the Delta Children Canton Convertible Crib will certainly help you save a lot of time, money and trouble – why invest in four different pieces of furniture, when you can benefit from the same features and functions with an all-round, feature-rich baby crib such as this one? This review will tell you everything you need to know about the benefits and the downsides of this four-in-one baby crib. As mentioned above, Delta Children Canton Convertible Crib is a great and very versatile choice, and one of the aspects parents seem to appreciate the most when it comes to this baby bed is the fact that it is made from solid hardwood – that, coupled with the advanced non-drop side design will keep your baby safe and sound throughout all of its growth stages. Moreover, the crib has received the CPSC, JPMA and the ASTM certifications, meaning that it is 100% non-toxic and safe to use by babies, it contains no lead or other dangerous chemicals or metals. The baby bed also comes with a comprehensive and easy to use toddler guard rail, it is very easy to assemble and it can be easily wiped clean with soap and lukewarm water, which once again helps parents save a lot of time. The convertible bed also comes with a three position mattress that allows you to easily adjust the height of the crib – in other words, you can easily make the baby crib grow along with the baby! Elegant, graceful and with a seemingly timeless design, this four in one convertible baby bed also comes with a beautiful arched headboard that is specifically designed to soften the lines of the crib. That, coupled with the dark chocolate finish add to the beauty and elegance of the entire construction – besides, the baby bed is fully compatible with just about any type of mattress, as long as it fits the bed frame perfectly. The Delta Children Canton Convertible Crib does have some downsides, and it seems that the convertible bed does tend to squeak during the first few days of use, which can be particularly bothersome for the toddler, as the little one will wake up on a constant basis. Some parents claim that they have tried to oil the hardware within the convertible crib, in an attempt to prevent it from squeaking so much, but it seems that nothing helped. Also, some parents have even claimed that this convertible baby crib was sent defected from the factory. To sum it all up, Delta Children Canton 4-in-1 Convertible Crib is good for parents who are looking for three important qualities in a sturdy baby crib: versatility, cost-effectiveness and safety.